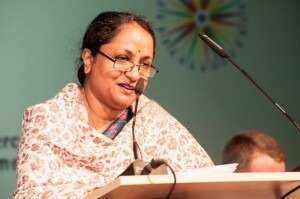 Sujatha Singh, the current Ambassador to Germany, has been named the next foreign secretary of India. Singh, 59, will be the third woman to hold the post and will succeed incumbent Ranjan Mathai. The foreign secretary occupies a pivotal place in the Indian government hierarchy and as a top diplomat will play a crucial role in forming India’s foreign policy. She was the Indian high commissioner to Australia from 2009 to 2012. Singh was instrumental in the change in Australia’s stand on selling uranium to India. The new foreign secretary has served in Italy, Thailand, France, Australia, Germany and Nepal. ‘Singh’s degree (masters in economics) should stand her in good stead during her stint” says Saeed Naqvi, senior Indian journalist and foreign policy analyst. She was joint secretary and then additional secretary responsible for West Europe and the EU in the Ministry of External Affairs in New Delhi. Singh will take charge on 1 August and complete her term in July 2015.